New York has become a two star street artist town. 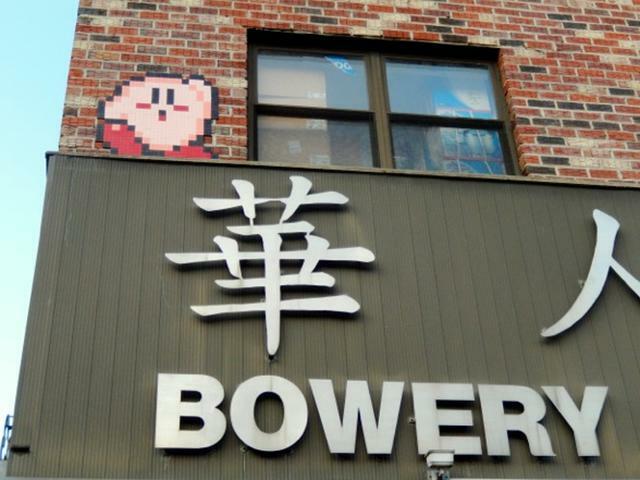 While Banksy is preparing for the end of his October residency, Paris street artist Invader is “invading” the Big Apple with his iconic porcelain tile mosaics. His name and signature derives from the video game Space Invader and video games play a big influence in many of his works, especially in their two-bit stylization. The invasion has just begun with many buildings in the Lower East Side now adorned with his works. The artist is town for a residency of his own as well as the recent screening and New York premiere of his short documentary, ART4SPACE. The short film follows Invader as he works on his project of launching one of his mosaics into the Earth’s stratosphere. Hearing of the convenient location of one of Space Invader’s new pieces, I looked forward to going to my internship at New Museum today a little more than I usually do. (Which is a lot, to begin with). Honestly, if I hadn’t known to look for it I probably would have just missed it. Placed on the New Museum’s 231 Bowery building next to the museum’s building, the piece is a small mosaic that includes the letter “I” next to the iconic space invader all included with in an apple, “forming the visual pun ‘I invade the Big Apple. '” as reported by ARTINFO.